That is generally the best way to describe both the present state of the AFC South and the wide receivers that populate that high-flying division. Indianapolis has had a stranglehold over this division since its inception in 2002. But Peyton Manning’s offseason neck surgery has sidelined the future Hall of Fame quarterback throughout the preseason. And if he can’t go or is limited this season while at the helm in Indy then the door is wide open for another team to jump up and seize the throne of the AFC South. The free for all is about to be underway. And my prediction is that the first team whose defense actually steps up and gets a stop will be the team that carries the South’s banner into the NFL playoffs in January. The AFC South went 42-21-1 against the total last year. That includes games against one another, but the fact is that throwing down on the ‘over’ in any game featuring these teams, and doubling down on divisional games, would have led to a sensational profit. Will Manning be healthy? Can Houston finally make its move? Will Jacksonville or Tennessee elevate to Sleeper Status? Can anyone get a stop? In a division that had been like clockwork over the last decade there are a lot of questions that need answering. Offense: This group comes down to two words: Peyton Manning. The Colts threw the ball nearly 700 times last season. I do think that Manning will be healthy and will play in all 16 games. But even if he does play there are reasons to question his effectiveness. If Manning is not 100 percent then this team is going to fall apart. The offensive line is still suspect, the wide receivers aren’t cohesive, and the running game is still nonexistent. If Manning doesn’t go then we could see the Colts average about 12 points per game. But, if he comes back and throws for 4,000 yards once again I can’t say I’d be at all surprised. Defense: As long as Dwight Freeney and Robert Mathis continue to combine for 20-plus sacks this defense will have a chance. Indianapolis has been playing a weak version of the Cover-2 for about three years now. They are fine against mistake-prone or inefficient quarterbacks and offenses. But if Indy goes up against a Brady, Brees, or Rodgers then they will continue to be torn to shreds. Basically, any team that can execute in the red zone – or that can force their way down Indy’s throat – will score a ton against this Colts stop up, which still suffers from a shortage of top-end talent. Skinny: The Colts still have a mental edge over the rest of their division. But if Manning isn’t 100 percent I have been on record as saying that this roster possesses three- or four-win talent. They have made the playoffs nine straight times and in 11 of 12 years, so until someone else seizes the throne it’s tough to bet against them. But I will have no problem doing so and I am predicting that the Colts miss the postseason, Manning or not. Offense: Houston is now in its sixth year of Gary Kubiak’s system and is now among the most potent attacks in football. Unfortunately for them, that is why, in terms of NFL betting and odds, they are among the most overrated teams in football. These guys can move the ball at will and score a load of points. But Matt Schaub and the Houston brass don’t seem to grasp the concept of offense as game management. It’s one thing to score a lot of touchdowns, gain a lot of yards, and tally a lot of fantasy football points. But it is another thing to control the tempo of the game, protect your defense, and nurse a lead by milking the clock in the second half. Until the Texans begin to do the latter they will remain a better fantasy option than Super Bowl contender. Defense: Wade Phillips is a total disaster as a head coach. But no one that knows football would question his ability to teach and lead the 3-4 defense. That said, it generally takes teams two or three years to make the personnel maneuvers that a 4-3 to 3-4 transition requires. So this year the Texans will still be plugging a lot of square pegs in round holes. They are still light in some areas, and Mario Williams’ progress as a linebacker (I think it’s a terrible idea) and DeMeco Ryans’ health are two keys to this group improving. But even by signing Jonathan Joseph I still don’t think that this organization has done enough to shore up what has been one of the worst secondaries in football over the past decade. Skinny: Houston has been “Everyone’s Sleeper Team” for the past four years. But they continue to underachieve and until I see them actually win a meaningful game in the first half of the year I’m not buying it. I think the Texans picked a bad year to make a huge defensive shift and I think they have still neglected the franchise’s Achilles heel (the secondary). There isn’t a lot of value on this team because the public is all over them. If Indy slips, they are first in line to step up and win the division. But don’t be surprised if it doesn’t happen and everyone is again talking about how “next year” will be Houston’s time. Offense: It’s difficult to handicap this offense because of the precarious situations involving their two best players. Kenny Britt has been nursing a sore hamstring and faces a possible suspension from the NFL for idiotic off-field decisions. 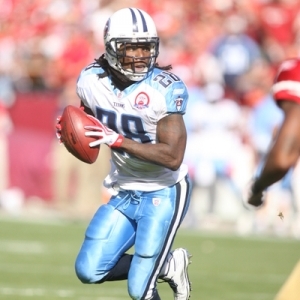 Chris Johnson is holding out and I’ll be stunned if he is in pads before October. With those two – and with the addition of underrated Matt Hasselbeck – this group has the potential to be explosive. Without them this unit may only make slight improvements from last year’s No. 27 ranking. New offensive coordinator Chris Palmer has a bit of a conservative style. And that tendency will only be exacerbated by not having his two best weapons. Defense: New Coach Mike Munchak retained defensive coordinator Jerry Gray. That should help the overall transition from Jeff Fisher, but I don’t know if Gray still deserves a job. This team has plummeted from the No. 2 scoring defense in the league in 2008 to No. 28 last year. Over the last two years their secondary has allowed opponents to complete 66 percent of their passes. Part of that is playing in a division with Manning and Schaub. Part of it is a terrible secondary. This team is still light in its pads and I don’t see many heavy hitters. Unless their scheme dramatically improves – or they benefit from a lot of turnover luck – the Titans extra point defense should continue to get a lot of work. Skinny: By the numbers, Tennessee was the NFL’s biggest underachiever in 2010. They only won six games but, according to their Pythagorean win total, they should have been 9-7. Tennessee actually outscored its opponents by 17 total points, and with Manning’s injury possibly creating a vacuum in the division there is some definite growth potential here. Watch out for a sleeper run from this team – if they get Britt and Johnson back and on the same page. Offense: Jacksonville is the one team in the division that is committed to an offensive identity of ground-and-pound. The maturation of their offensive line after a weak 2009 was a big story last year and overall they have averaged 4.6 yards per carry as a team the last two seasons. They will keep going to the well…and Mo-Jo Drew is the bucket. Drew is coming off knee surgery, but he was supposedly banged up heading into last year and then rushed for 1,300 yards in 14 games. Their receivers are mediocre and the passing game is not even close to good enough to get the team back in games if they fall behind. But as long as they keep pounding they should keep moving the ball, especially in their Downy soft division. Defense: Jacksonville’s defense was masterful at getting accidental stops last year. Basically, they just stood there, and the opponent either scored or did something foolish – sack, dropped pass, penalty, etc. – to snuff out a drive. I don’t feel that they have upgraded their talent significantly, so apparently they are hoping that scheme just kind of works again. Now, I will say that I loved the Dawan Landry pickup and Matt Roth was a coup. But this is still the same core group that hasn’t finished higher than No. 21 in the NFL in defense over the past three years. That poor defense should help them maintain their exceptional run (14-5 in L19) of going ‘over’ the posted total as well. Skinny: I have no idea how this team won eight games or how they found their way into the playoff hunt last year. They can’t pass, they can’t defend, and they were -15 in turnover differential. They also won four games – Oakland, Cleveland, Houston, Indy – in the last 1:40 of the game. Basically, they were very lucky. But I don’t see that carrying over to this year. The Jacksonville Jaguars schedule includes the AFC North and NFC South, two of the three best divisions in football, as well as crossover games with the Jets and San Diego. I think that this team is in for a hard fall.